People, Peru is having a moment. People are flocking there en masse to try Ayahuasca, shop baby alpaca sweaters, see Machu Picchu, and of course, to eat tons of delicious Peruvian food. 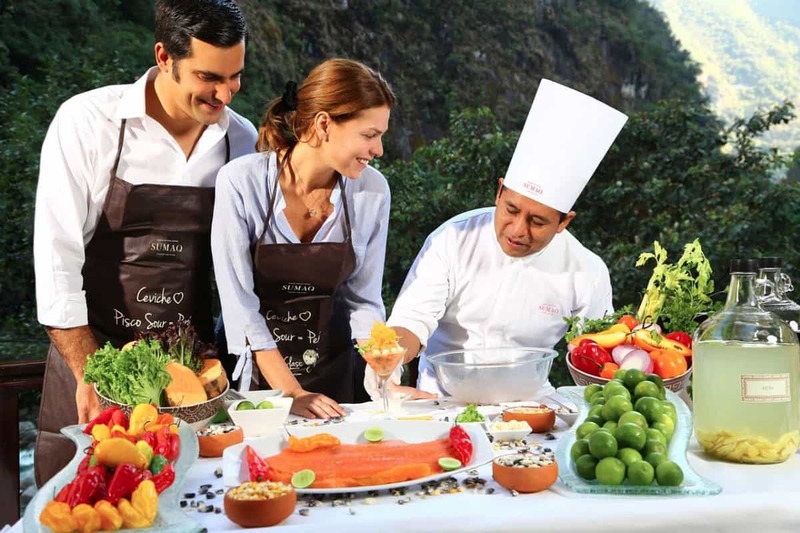 Cuisine here is different from other Latin American countries, thanks to a culturally diverse population, an abundance of fresh, natural ingredients and of course, creative and talented chefs. 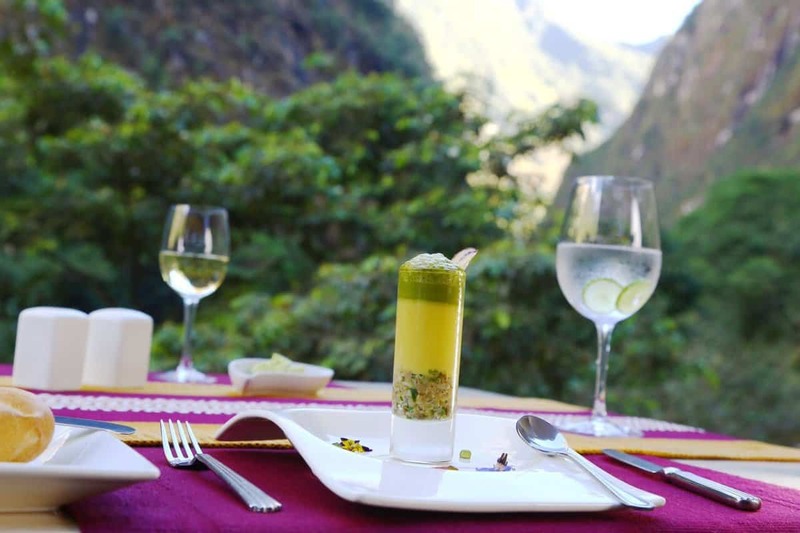 Speaking of which, we went all the way to the Sumaq Hotel, a stunning luxury property just at the base of the cloud forest surrounding Machu Picchu, to talk about food with their top rated chef, Carlos Pardo Figueroa. The Sumaq takes Peruvian cuisine seriously, offering guests cooking courses and altering menus to suit vegan and vegetarian needs. Some of the drool-worthy dishes we tried there included avocado risotto, mushroom ‘cappuccino’ and vegan ceviche. 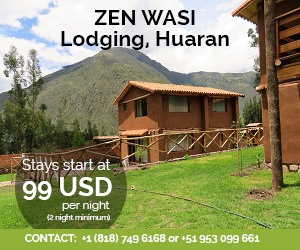 Interestingly, the hotel incorporates indigenous Peruvian traditions into the experiences of its guests. 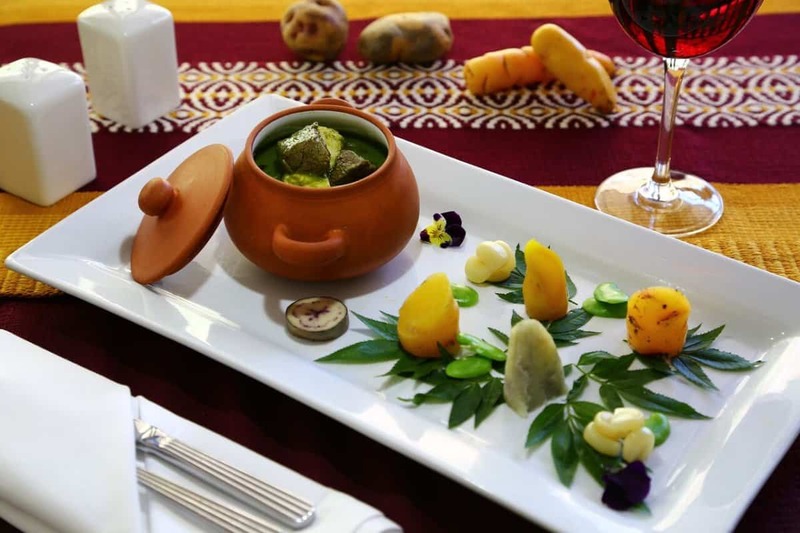 For example, the culinary tradition of the Incas called Pachamanca, demonstrates how a traditional Andean meal is prepared: hot stones are placed to form an underground oven for local ingredients such as potatoes, fava beans and herbs. All the ingredients are capped with large leaves before the ‘oven’ is sealed up with earth, cooking the food with the heat of the stones. When the meal is finally ready, a memorable lunch is shared with the Andean natives, and an offering to Pachamama is given in thanks for the succulent meal. 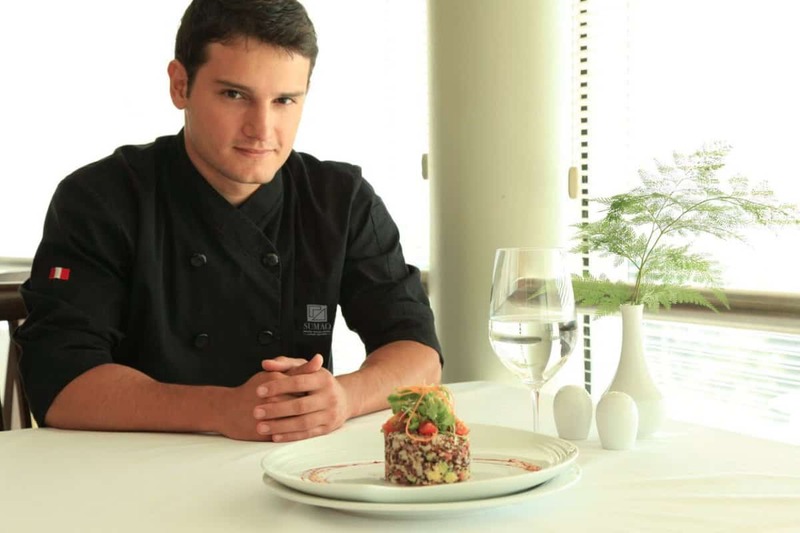 We asked Chef Figueroa to tell us more about Peruvian food traditions. How would you define Peruvian food? To define Peruvian gastronomy, we need to understand the geography and climate of Peru. We have three main regions: the coast, sierra and the Amazon. In these regions, we have 16 different altitudes, each one crowded with many micro climates. As a result, Peru has one of the largest collections of flora, fauna and foods in the world. Add to this cultural influences: First, there are the Inca and pre-Inca cultures, our legacy. Then the conquerors who brought Spanish influence. With the Spanish came the Africans as slaves, adding their culture. Later, Chinese labourers replaced the Africans, and then we had many immigrants fleeing the World Wars, especially Japanese and Italians. As a result, we have many different cultural influences that have shaped the cuisine of our country. What are the essential herbs in Peruvian cooking? We use native herbs including Muña (a kind of mint), Chincho, Paico and Huacatay. We refer to them as “Andean herbs” Another main herb is cilantro and, in some cases for beverages, lemongrass. A curious point: we give more importance to aji (chili) than herbs. 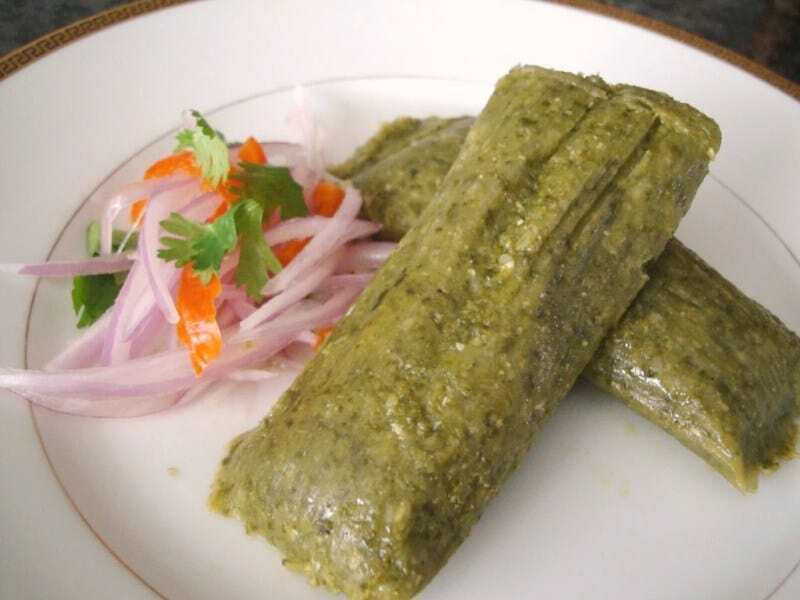 What are some classic vegetarian Peruvian dishes? How can you put a vegan spin on traditionally meaty or fishy dishes? 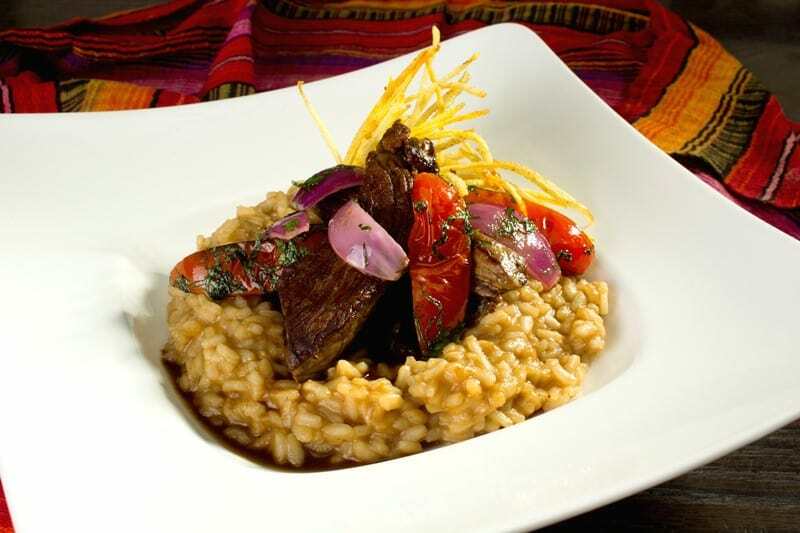 We make a really nice version of popular risotto with quinoa; we call it ‘quinotto.’ We also do a version of the Lomo Saltado Ã¢â‚¬’ stir-fried beef using Chinese techniques Ã¢â‚¬’ but with veggies only. We also prepare a corn pie; it normally comes stuffed with meat, but we do an all-veggie version. And we do have an amazing three- color quinoa salad. Ceviche is normally fish “cooked” in a marinade of lime juice with salt, chili, cilantro, onion and often other ingredients. Since the marinade for ceviche is vegan, we can substitute fish with any tender vegetable the guest prefers. 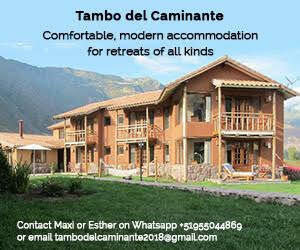 We prepare Andean mushrooms ceviche, artichoke ceviche, confit tomatoes ceviche and other versions. The “sauce” or marinade for the ceviche is the result of the fish protein cured with lime juice and salt. We normally add to this sliced red onion, minced aji limo (chili) and chopped cilantro. The juice that results from this marinade has a strong salty-acid flavor, which we call “leche de tigre” (tiger’s milk). As the protein cures in the lime and salt, it starts to turn into a white milky colour, and when you taste it the flavor is so intense it makes you “roar like a tiger.” The ingredients for the marinade depend on the type of fish being used. With tuna, for example, adding ginger and sesame creates amazing flavors. Adding dill and orange or passion fruit is sensational with salmon. The base of ceviche will always be fish, lime, salt, onion, chili and cilantro Ã¢â‚¬’ from there you can go crazy with combinations. 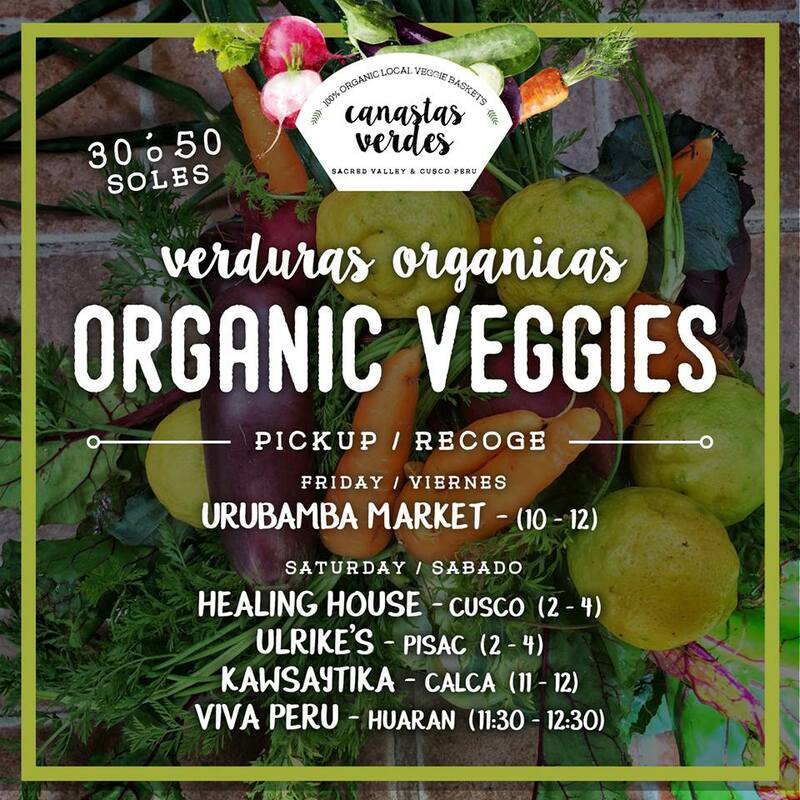 If you’re not able to travel to the Sumaq yourself to indulge in Peru’s legendary fusion cuisine, at least try to make some vegan Peruvian recipes at home, using ingredients native to this mystical nation. Here, we’ve found 30 amazing recipes that will inspire you to book a ticket and hop on a plane to Cusco! Peru is privileged to be the home of the camu berry, which has the highest source of Vitamin C found in nature! Adding just one teaspoon into this smoothie will give you a super boost! Mixed with greens and cashews, you’re left with an incredibly frothy smoothie that will hydrate you one sip at a time. You’ll find avocados featured quite a lot in Peruvian cooking, so what better place to use them than a smoothie? Thet give a great boost of healthy fats and made drinks extra creamy. This Peruvian inspired superfood smoothie is like sippin’ back a cup of the tropics thanks to the pineapple juice, lime and coconut milk. Maca is a native plant from Peru that has a healthy dose of Vitamin B1 and B2 and has even been known to increase the libido. Mix a teaspoon into your morning smoothie to get a real energy boost – the flavour compliments the ‘mocha’ perfectly, as it has an almost caramel like taste. Amaranth is one of the world’s oldest grains, so add a little bit of history into your bowl of porridge. You can keep it as simple as you wish or jazz it up a little. I’d definitely recommend adding in berries and pomegranate seeds. It looks great, but tastes even better. P.S. Switch out the honey for maple syrup or agave to make it fully vegan. Once cooked, amaranth has a huge amount of nutritional value and is an excellent source of both protein and fiber, so using it to make granola is a great way to start your day and get your engine running. The amaranth is toasted in this granola and tastes similar to an oatmeal cookie, and it’s delicious! Enjoy with some coconut yogurt for a quick yet fueling go-to breakfast. This recipe calls for amaranth flour to create crackers that are crispy, have a slight nutty taste infused with both herbs and garlic, and I won’t lie to you – you’ll struggle to keep your hands off of these when they come out the oven. Use them to dip in some of the gorgeous recipes further below . 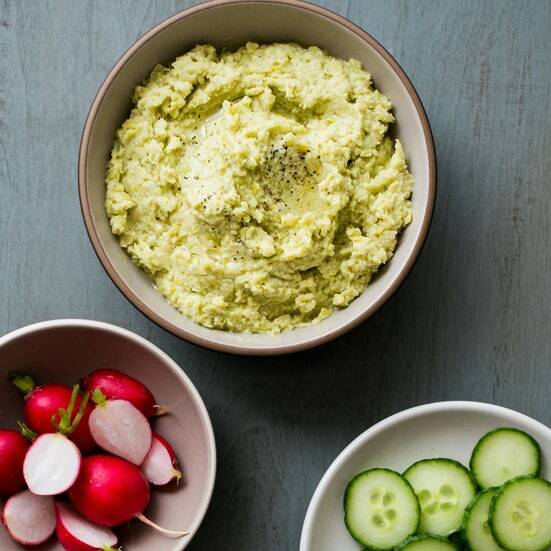 . .
I’m a huge hummus lover – but sometimes it’s nice to move away from the chickpeas. Here, the traditional Lima beans (named after Peru’s capital city, of course, and also known as fava beans) add a really buttery texture, making the hummus both smoother and creamier than you’d expect! This recipe calls for season grapefruit and for good reason. When fruits are harvested during their season they contain more vital nutrients that we need. Plus they taste so much better! Use ripe grapefruit in this quinoa salad and you’ll love the mixture of flavours and textures. The pecans and dates definitely lend a gentle sweetness to the sharpness of the grapefruit. Fresh corn and cilantro leaves are the base ingredients you’ll need to make this super comforting and delicious dish. 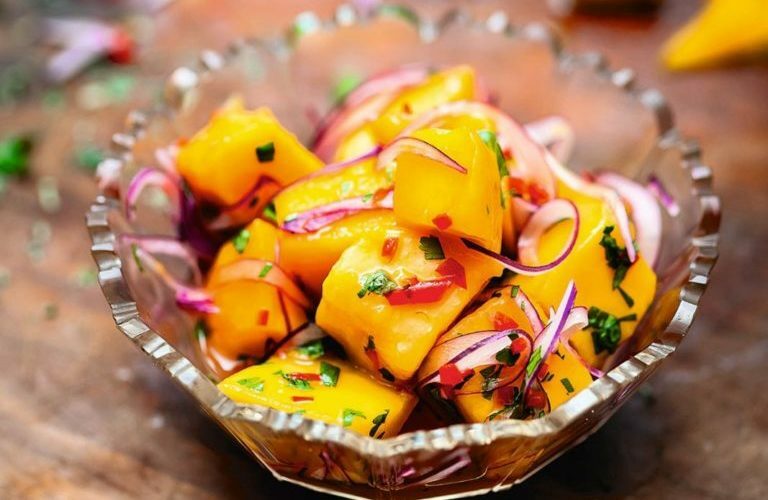 In Peruvian cuisine, it’s enjoyed as either a light appetizer or side dish and I gotta tell you – it’s YUM! Green corn husks are used as a wrap in this recipe, but remember to clean them beforehand but DO NOT boil them. You want to maintain as much flavour as possible. I told you avocados would feature often, and we’re mighty glad they do! Charred avocados are next level; they’re still creamy and yum inside, yet have a slightly different flavour and texture outside. Stuffing them is a great way to turn an avo into a main dish. You’ll find plant-based protein in this recipe from the tofu alongside an abundance of veggies such as broccoli and red onion and even some apricots. Much like stuffed avocado, stuffing sweet potatoes is a really great way of turning what is essentially a side dish into the main event. And with sweet potato and quinoa you’re getting a really healthy boost of plant power. Who else loves the way avocado turns food a wonderful shade of green? Whilst adding a subtle flavour, the avo also makes this risotto even creamier than usual. This recipe does use cheese, but you could easily use a vegan substitute or, if you’re a nooch fanatic like me, sprinkle in some nutritional yeast. If you’ve ever had mushroom soup before then you’ll know it’s pretty rich when it comes to dairy from the milk and cheese. So when you think of making a vegan version is feels almost impossible. Until now! In fact, this mushroom soup is SO creamy you’ll even have those dairy-lovers among us disbelieving this is 100% vegan. Just look at that vibrant colour from all those veggies! Stews are such a great hearty meal to make when you’re in dire need of quick food and nourishment. Once the prep is over, you can pretty much leave this to cook for around fifteen minutes, and when you go back it’s done. Magic! 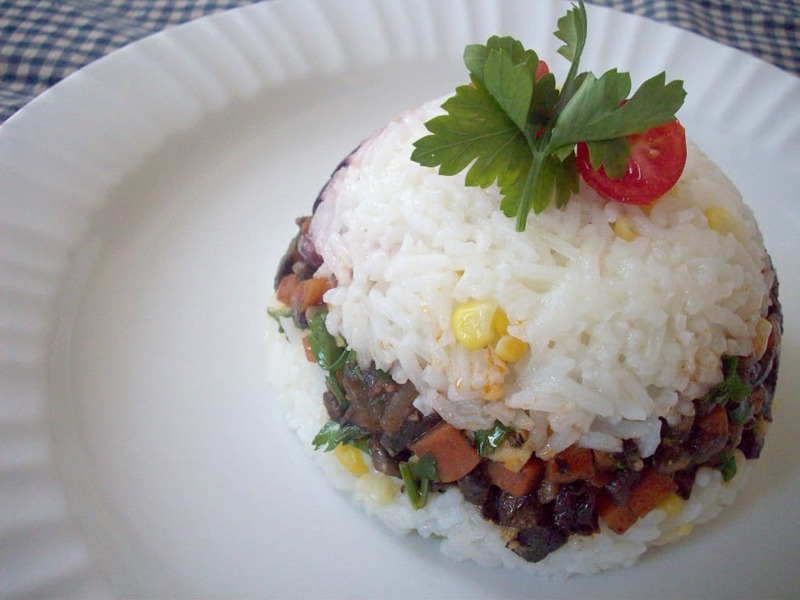 This elegant dish normally contains meat on a bed of rice, ‘topado’, or topped, with more rice, plus cilantro or shaved red onion. Here, mushrooms take the place of meat. There is a boiled egg in this recipe, but if you’re not ‘vegg-an,’ you can just eliminate it with no biggie. Is there anything better than a wonderfully creamy, warming soup? Even in the height of summer I still love my soup, albeit with a fan on whilst I eat it because y’know, heat in heat isn’t always a recipe for success. You could use fresh pumpkin in this recipe or, if you’re anything like me, use pureed pumpkin. Whilst a traditional lomo saltado would be served with french fries and fluffy white rice, Peruvian cuisine has become somewhat tweaked over the years and so it’s nothing too odd that this is served with risotto. Plus the creamy risotto soaks up all of the flavour and infuses the stir-fried veggies with a burst of flavour. Portobello mushrooms make the perfect ‘lomo’ meat substitute in this dish. This recipe is a raw take on a popular Peruvian dish, so there’s so slaving over the cooker. 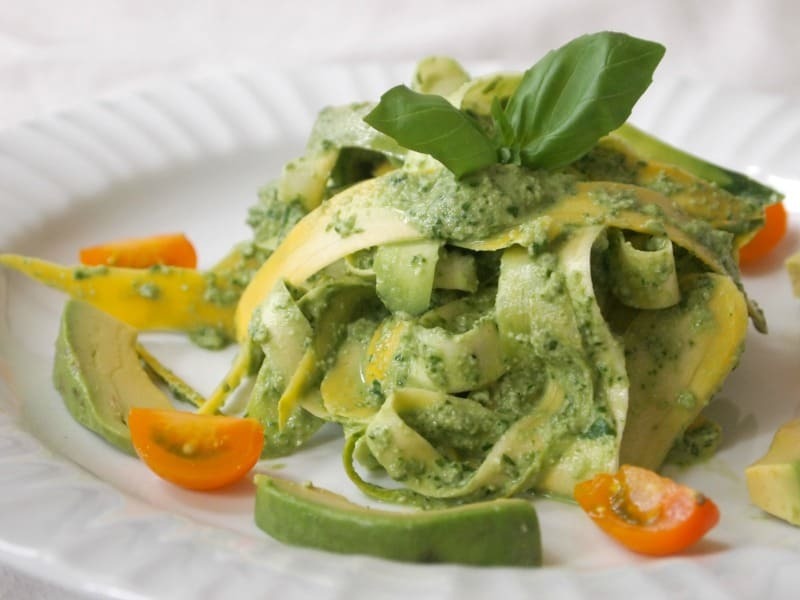 It’s essentially raw zucchini noodles with a pesto sauce. Making your own sauce from scratch is not only easier but heaps healthier! Instead of cheese cashew nuts add a wonderful texture. 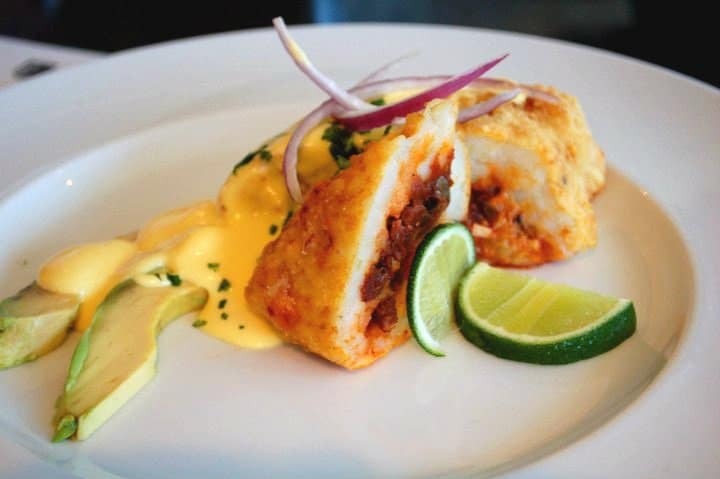 Papa a la Huancaina is a Peruvian dish of spicy creamy cheese sauce over boiled potatoes. In this recipe the cheese is made from seeds, veggies and spices making it 100% vegan friendly. The creamy sauce goes oh so well with the potatoes, this is a dish you’ll want to make again and again, believe me. This is a vegan take on the Peruvian recipe that calls for meat and dairy. Papa rellena is a baked potato dough that is then stuffed with its filling and then deep fried – but you can bake them if you prefer. 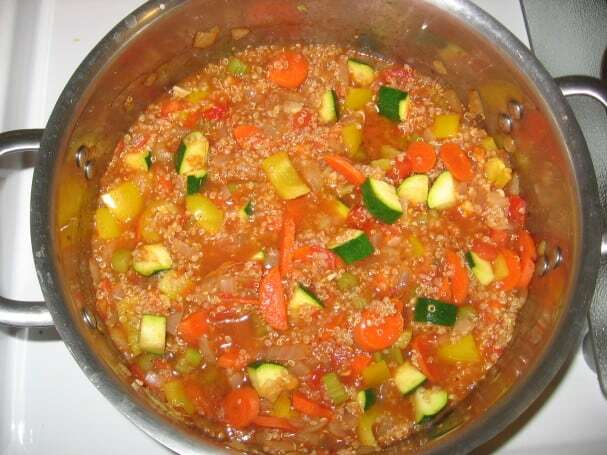 This recipe calls for lots of tasty ingredients from tomatoes and peppers to mushrooms and sweet onions. 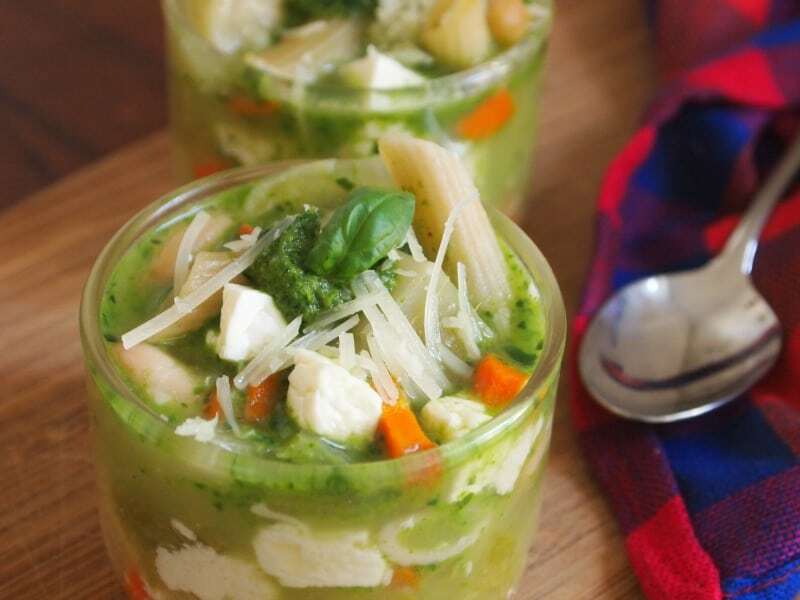 Menestron is pretty much a Peruvian adaptation of the Italian soup that we all love so dearly – minestrone. With the vast amount of fresh produce available the ingredients have been tweaked somewhat. So you’ll find yucca, potatoes and kernel corn simmering in the pot, but this can at times be switched out in place of pumpkin, sweet potato of fava beans. The one big difference is that unlike the Italian version, this dish doesn’t have a tomato base. This recipe does call for feta – either opt for your own vegan feta or just skip it. Who doesn’t love sweet potato mash?! It’s such a great comfort food for me. This mash is mixed with vegan butter to make it extra creamy, garlic and dill to increase the flavour, whilst nutmeg adds a delicate sweetness which compliments it really well. Seafood doesn’t have to be the basis to your ceviche, especially when vegan. Switch out the fishiness for some fresh and juicy mango! The fruit is then beckoned by the onion, spicy chilies, a little drizzle of lime juice and a fluttering of cilantro. This is a really light yet super delicious dish you’ll find yourself making into the foreseeable future. So, what makes hot chocolate Peruvian I hear you ask? 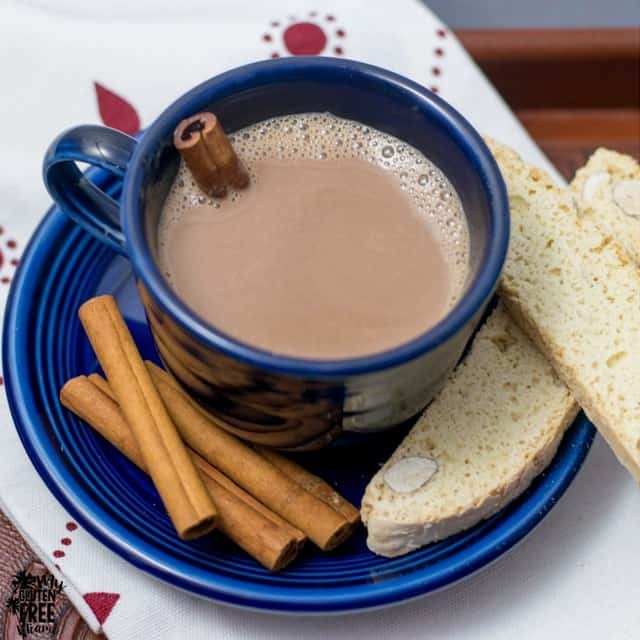 Well, Peruvian hot chocolate is infused with both allspice and cinnamon, giving it a wonderful flavour that kicks it up a gear from your typical hot chocolate recipe. To make it vegan, sub in any ‘mylk’ you like for milk, and instead of condensed milk, use condensed coconut milk (recipe here if you can’t find it). Yum! A drink made from…corn. Okay, so I was dubious at first too. But not anymore! That gorgeous colour comes from Peruvian purple corn that has been dried out. The corn is then placed into a pot with water, cinnamon sticks, whole cloves and the skin (yep, the skin) of a pineapple and left to simmer for 45 minutes. Once finished, simply add some fresh lime and sugar and you’re left with a beverage that is subtly sweet and mighty refreshing. 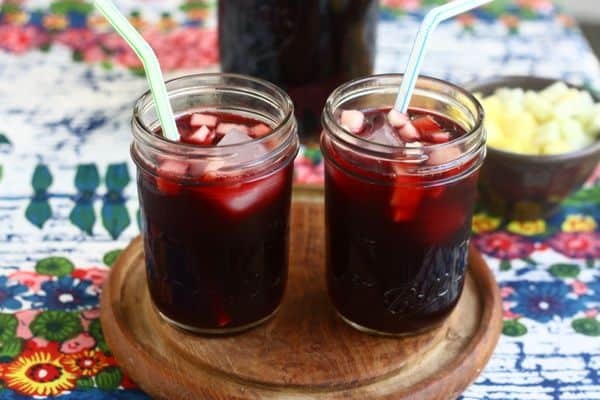 Champus is a popular Peruvian dessert made with fruit. It’s both light and low-fat, and also incredibly good for you. 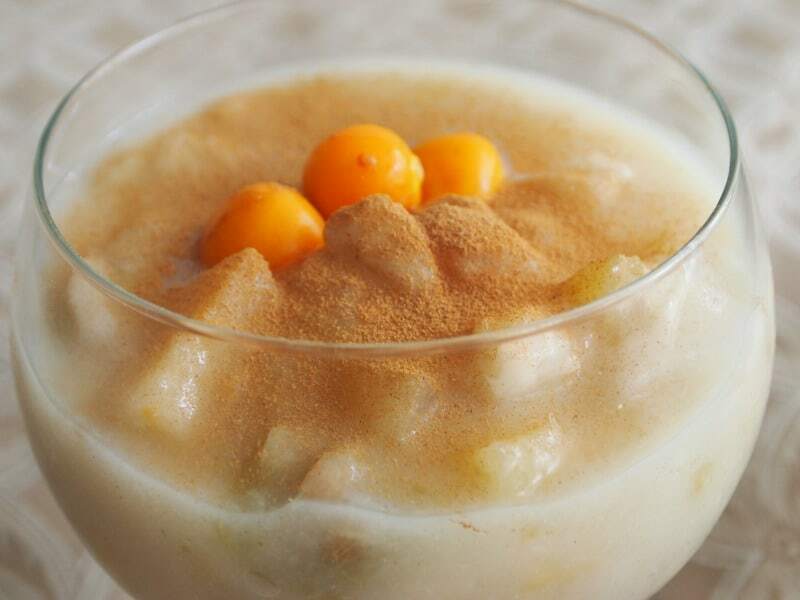 You can enjoy this dessert hot but it’s traditionally enjoyed cold. You can play about with the fruits you use, depending on what’s available. 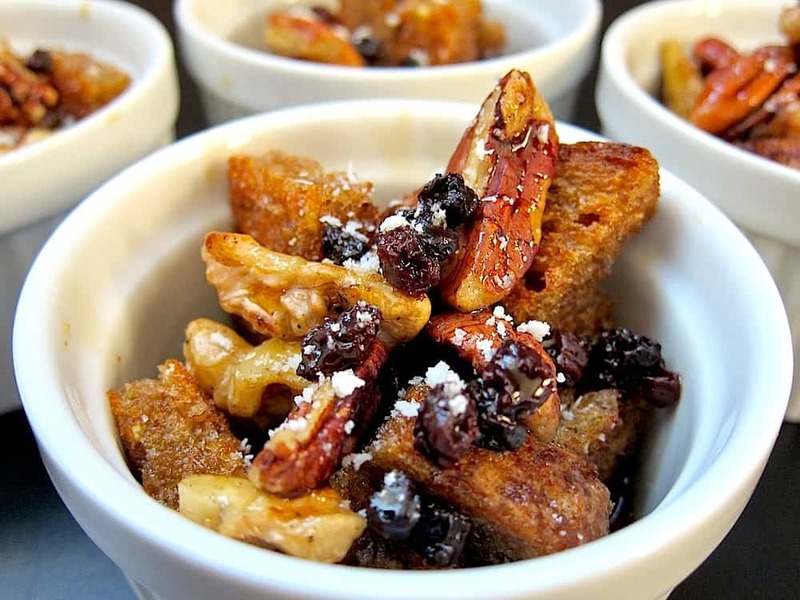 Like many dishes that have become tweaked over time, there are many, many variations of Peruvian bread pudding, otherwise known as ranfañote. This recipe is kind of like a minimalist version. The croutons are made from whole grain bread, currants are used in place of raisins and whilst parmesan cheese is used as a garnish – obvs omit this if you’re vegan. Save time by soaking your currants and toasting the pecans and walnuts ahead of time. This Peruvian recipe was first prepared over 400 years ago, so there’s a lot of history in this dish. 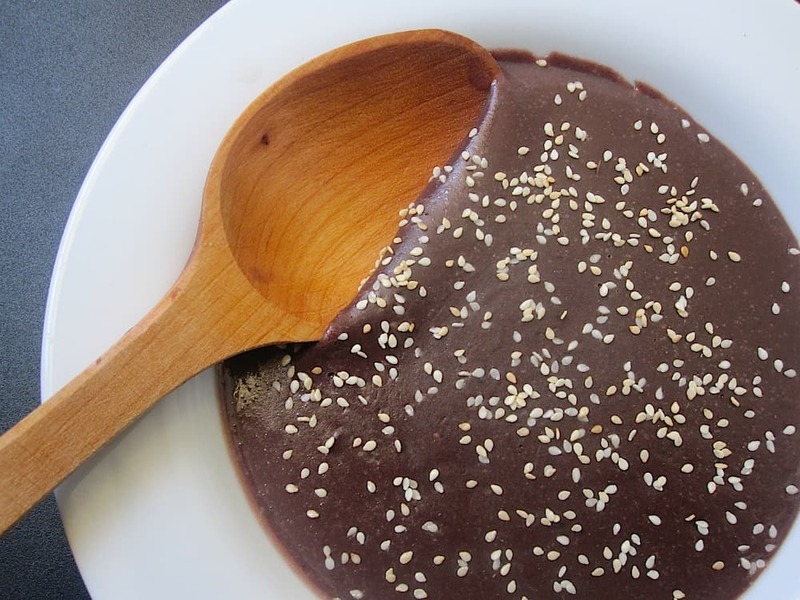 The combination of black beans, (almond) milk, sugar and spices make this dish undeniably Peruvian in style. Removing the skins of the beans to puree them achieves the perfect texture, making them into a thick paste. The spices are them broken down to a fist dust to add a flavour that doesn’t overpower the dessert too much. An alfajor is a traditional confection in Peru, and this dish is very much inspired by this. 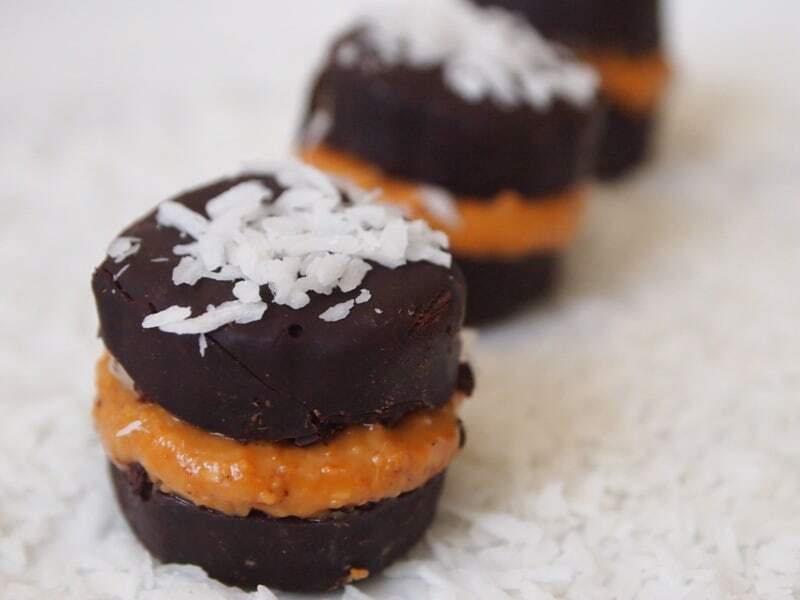 Cacao is the real star of the show here proving that you can still make healthy and delicious treats using superfood.s If, however, you find that cacao is a little too strong, as I did, you could always slip in a little maple syrup to sweeten it up a tad. I love seeing the word raw because it means no baking, woo! This delicious raw carrot cake is the perfect sweet treat to enjoy, and the gorgeous frosting is made from cashew cheese. More dense than your average carrot cake, this recipe contains mostly, you guessed it . . . carrots. They’re super nutritious when eating in their raw form, and are easy for the body to digest. Subscribe to our newsletter to get updates!